Along with a pair of classically colored, white and black Superstar 80s, adidas Originals also dropped a matching tracksuit to commemorate the 25th Anniversary of RUN DMC’s hit single “My adidas”. On November 11th in 2011 stores opened wide for flooding fans to snag a sweet track top and bottoms as part of the “My adidas” 25th Anniversary Pack. 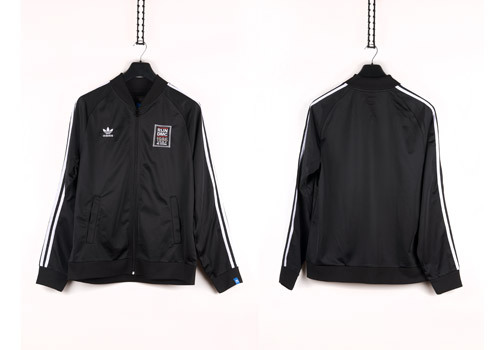 The black polyester legacy style track top is fashioned with white side stripes running down the sleeves and the RUN DMC “1986 25 years of My adidas” logo embroidered to the left breast. The right breast is embroidered appropriately with the adidas Originals trefoil in white thread. As is their custom for recently released clothing, adidas hides a miniature white trefoil on blue fabric sewn around the left cuff. 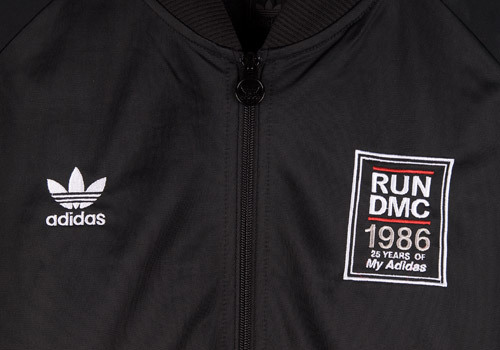 Sold in combination with the jacket is a pair of track suit pants that match perfectly; white stripes on black polyester with a RUN DMC embroidery balanced by an adidas Originals trefoil. Both the tops and bottoms are very light weight and extremely comfortable to wear, donning zipper-less side pockets to carry around your swag with you wherever it is you might be spitting, spinning, or spraying up next.